Mount Gambier Central has four Pop Up Retail spaces available for daily, weekly or monthly bookings. All the sites are located within the Central Mall near or adjacent the busy Food Court or entrance to Foodland. So what are the benefits of a Pop Up Retail space at Mount Gambier Central? Affordability – A Pop Up Retail space at Mount Gambier Central is an affordable way you can take advantage of being within our busy sub-regional shopping centre for a temporary time to promote your business or services. 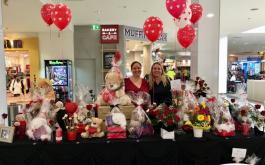 Brand Awareness – A Pop Up Retail space at Mount Gambier Central will help you generate brand buzz about your business or service. Don't just think a stand or a display, Mount Gambier Central offers a wide range of promotional opportunites to further increase your business buzz such as floor and door decals, large format posters, hang downs, pillar wraps just to name a few. Encourages Testing and Trials of New Merchandise – A Pop Up Retail space at Mount Gambier Central provides your business with a unique opportunity to get immeidate feedback on your service or product. A Pop Up Retail space is ideal for sampling new products and getting immeidate feedback. New Revenue Stream – A Pop Up Retail space at Mount Gambier Central provides you with an opportunity to increase your sales by taking your store to where your customers are and making it more convenient for them to buy from you. There are significant profits with minimal risk for adding a revenue stream in a local area.